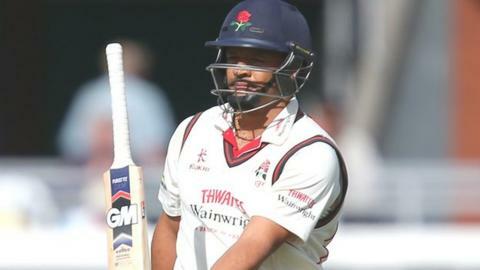 Lancashire's early-season momentum remained high after Ashwell Prince's century against Kent at Old Trafford. The Red Rose ended the opening day on 317-5, thanks to Prince's resolute 106, his 41st first-class century. Fast bowler Matt Coles struck two early blows for Kent, including Alviro Petersen for a first-ball duck. But Prince added 98 with Paul Horton (71) and 75 with both Steven Croft (37) and Alex Davies (47 not out) to give Lancashire a strong platform. When Prince fell to Mitch Claydon 15 overs before stumps, Jordan Clark, a Whitehaven-born 24-year-old making his first-class debut, went in to accompany Davies safely through to the close. "All in all, we have to be happy with it, although if we were being really critical we would say one or two of us got out softly - and I would probably include myself in that. "The most important thing is to try and make a contribution when you go out there. A lot of people make too much of reaching three figures. "We had one or two nice partnerships and we did last week too. That's the big thing. It is always easier to bat in partnerships rather than as individuals. "It was a good wicket so it was a useful toss for them to have won. "We battled hard and created a few chances. On another day with a bit more luck we might have had them seven or eight down at the end. "The scoreboard looks like it's in favour of Lancashire, but we have a key morning ahead of us."